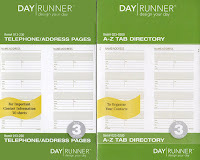 Day Runner A-Z Tab Directory & Telephone/Address Pages Refills, 2 prizes to be awarded: each with one of the Day Runner products pictured. Both 6-hole punch refills, in sealed packages, fit Size 3 Day Runner Planners and each measures 3.75" x 6.75". This giveaway contest ends on January 11, 2010 at 11:59 p.m. PST. FTC Disclosure: MommyBlogExpert purchased these Day Runner products and is giving them away for this contest. MommyBlogExpert did not receive any payment or other compensation associated with this post or this giveaway contest. See complete FTC Disclosure information that appears at the bottom of MommyBlogExpert's main page and at the bottom of every individual post on this blog, including this one. My favorite thing about this item is that it includes space for a few different contact numbers for each person. I love this item! We travel fulltime and are constantly adding new addresses and phone numbers, so the ability to keep adding pages is great! Now that we have my MIL living with us, I have so many drs appointments to keep track up this would be wonderful. Perfect for keeping those inportant numbers in one spot. Would love to win this as I haven't purchased the refills for my dayplanner yet for this year! My address book needs to be updated in a bad way!